I’ll tell ya. 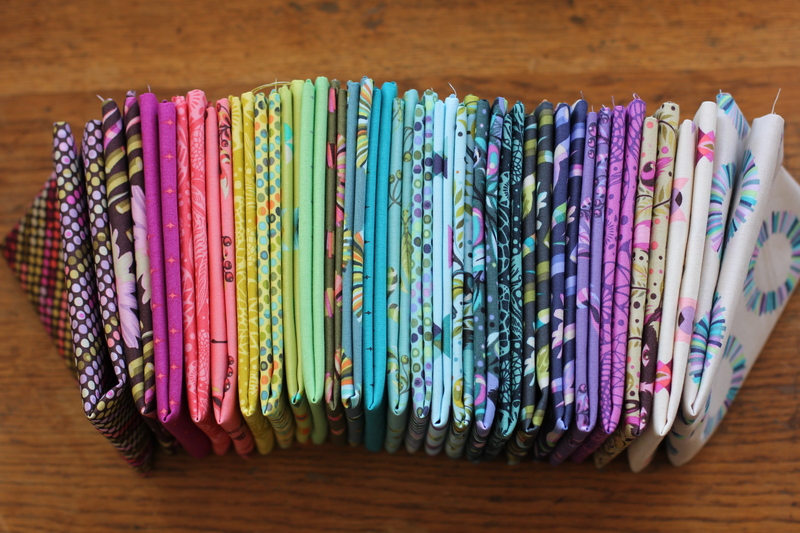 Remember when I drank the Kool-Aid at the Portland Quilt Market Spring 2013 and I said “I finally get why so many people are obsessed with Tula Pink!” If you don’t remember, you can read about it here. (I was able to capture some good photos while there, I think it’s worth taking a look at). Well. Two days ago the child of that Kool-Aid-induced-decision-making-funtime showed up. Twenty-five bolts of Tula Pink’s newest line called Acacia is here. Yesterday we (David, Melissa, and I) spent a goodly amount of the day cutting, folding, bundling, kitting, petting these newest fabrics. I took WAY too many photos of the collection and have been thinking WHAT AM I GOING TO DO WITH ALL OF THESE PHOTOS?! But I couldn’t stop. So, here is a lil’ photographic journey of the bundles and kits we’ve put together. I’ll meet you at the bottom momentarily. We call this one above the Amelia colorway. Pretty pinks turning coral. We call the one above the Pauline colorway with its unexpected color combinations that work together seamlessly. We call this dominantly purple bundle the Bernice colorway. All good Bernices claim purple as their favorite color. We have kits of the Peaks & Valleys Quilt which I thought was the best quilt at the show. We put them in cute lil’ plastic zipper bags that our friend Ashley at Nurture gave us. She’s trying to purge. It seems we are always trying to hoard. And of course we have the English paper piecing kit she created called Diamonds in the Sky. It seems we are now officially armed with enough beautiful fabric to make some pretty spectacular things. I’ve got to get to work on my Peaks and Valleys quilt! If receiving Tula’s fabric wasn’t enough, on Tuesday we’ll receive Birch Organic’s Fort Firefly and Alexander Henry’s Ghastlie Christmas fabric. YOU GUYS! It’s go time. My name is Susan and I’m a Tulaholic. LOVE all of these. I am going to try to find the shop in a couple of weeks and check out all that you have!!! is there a pattern for peaks and valleys quilt? Thanks!! We have the kits in our store, if you need one! I want that fabric bundle. It is fabulous! Hi Heather! I really enjoyed visiting your shop this week, and as promised, I blogged about it. I’ll be back!